Obviously, trees are rooted to the ground. But they move, too! To make sense of these two seemingly contradictory statements, we have to change our time scale. Consider a tree, from its germination to its death. It will most likely stay in one place and you'd get pretty bored watching it. But if you look at a tree population over several generations, you'll see how it moves. Seedlings colonize new sites, while old trees die off and give up their places to new plants. Individual trees remain in one place, but the tree population moves. With a bit more chronological perspective, over a few thousand years, for instance, you will see that trees' geographic distribution changes. Baobabs appeared in Madagascar and then, thanks to their floating seeds, gradually colonized Africa and Australia. When the glaciers descended into Europe, oaks retreated to southern Spain, Italy and the Balkans, and plane trees, trapped between the ice and the Mediterranean, vanished from the continent. 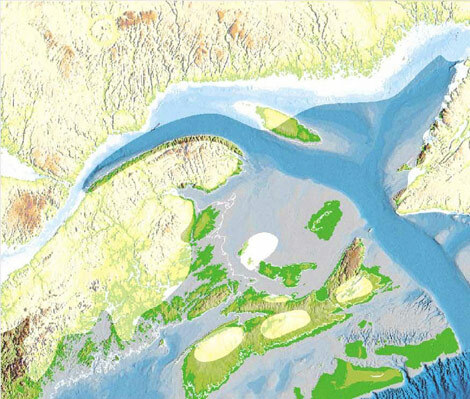 You can also see how trees colonized the Gaspé peninsula and Anticosti Island.